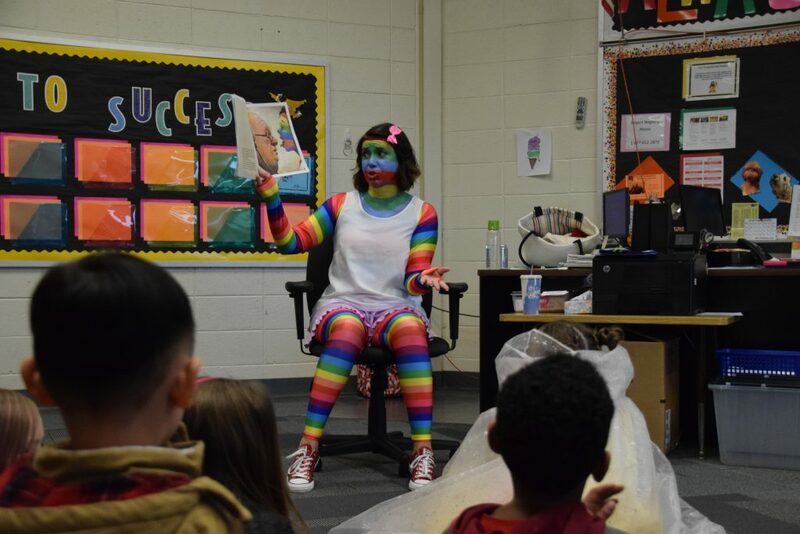 Young School teachers got into character to read to their students at the annual Family Learning Series Character Reading Night. Second grade teacher Detta Barron reads “A Bad Case of the Stripes” by David Shannon dressed as the book’s main character, Camilla Cream during Character Night at Bernice Young Elementary School. On Wednesday, April 10, literature came alive for students at Bernice Young Elementary School. That evening, children returned to their school to be greeted by characters straight from their favorite books at the school’s annual Family Learning Series Character Reading Night. For the event, several Young School teachers donned elaborate costumes and took on the role of a character from a children’s book. Families visited each classroom to hear a different story read by one of its characters and participate in a fun craft related to the book. “These are some dedicated teachers who have been doing this for years,” said Vice Principal Gary Russell of his staff who came out to volunteer for the event. Russell is in his final year at the school before transitioning to another building and wanted to “go out with a bang.” In previous years, he acted solely as a coordinator for the event, but given that this would be his last opportunity to actually participate, he came to Character Night dressed in full pirate captain regalia to read “How I Became a Pirate” by Melinda Long. “Character Night is all about teaching kids the importance of reading and the fun of reading. We highlight different books and the teachers dress up as different characters to show them that reading isn’t just something to do and then shove into a corner before bed, it’s something to enjoy in their free time as well,” said Russell. According to the vice principal, the idea for Character Night came from some of the dedicated staff who got creative with their teaching style. They came up with Pirate Day to kick off learning the AR blend (words that begin with the letters A and R) with their first graders. The students’ positive response to the costumes led to the creation of Character Night. Rebecca Petrecca teaches kindergarten through second grade at Young School. She came dressed as the elephant character Horton, from her favorite children’s book, “Horton Hatches the Egg” by Dr. Seuss. After her reading, students got to color their own paper eggs to take home with them. Petrecca strives to instill a love of reading in her students during regular school days as well. She currently has her second-grade class participating in a reading stamina challenge. “Every day we’re trying to build up more and more minutes as part of our chart. We’re working towards getting to a goal of 30 minutes total reading,” said Petrucca. Residents Ricardo and Marsha Garcia brought their 2-year-old son Jalen, who will be attending Young School when he turns 3, to Character Night. Ricardo thought that adding a visual element to storytelling was a great way to keep the children interested and engaged in the reading and spoke to their sense of imagination. The parents were impressed with Character Night and are looking forward to their son’s time at Young School.